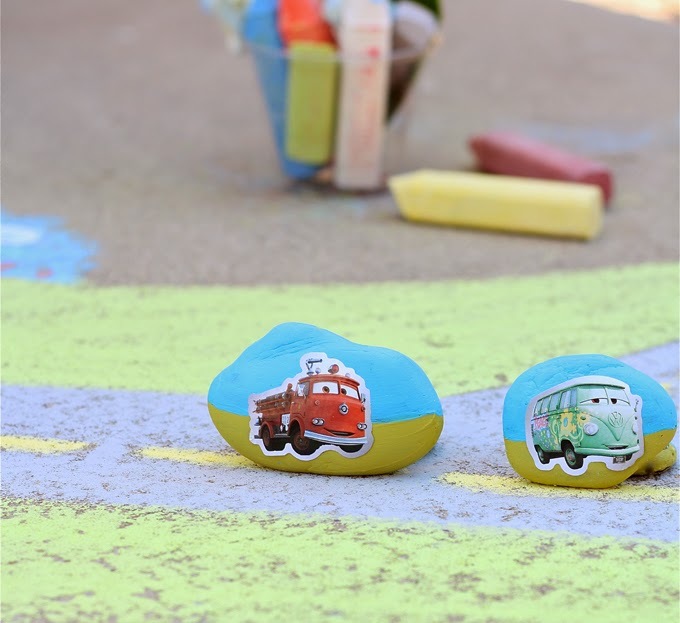 Rocks gone wild by painting and crafting into cars! Remember “My Pet Rock”? Well how about “My Pet Car, or Train”? Another art project on the list for growing our creativity was painting rocks and turning them into fun characters! At first I wanted to paint trains on them but I was getting too detailed and this started to take too long. We decided to use stickers instead, of some of our favorite TV characters. My son painted the rocks (and I enhanced them greatly with color separation) making them look like the sky and ground. Then we placed our sticker characters on the rocks and created our background with sidewalk chalk. Once the stickers are on I suggest covering the entire rock with MOD PODGE paint to seal it and prevent the paint from chipping. stickers – any character you like!